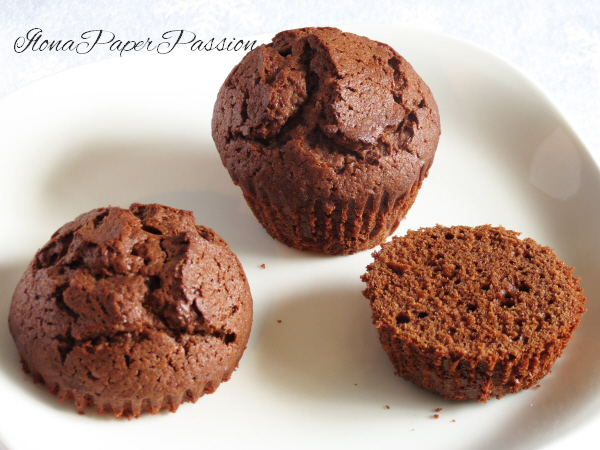 These chocolate muffins vanished very quickly from my kitchen. I baked them and I was going to put frosting on top of it, but I liked the idea of frosting between two layers of muffin. Anyway I liked how they looked on the top after baking. There is a major plus.. they are very easy to cut in half and they will not break. This recipe is for 6 muffins, please double ingredients if you would like 12 muffins. Prepare muffin baking pan with liner. You may grease paper liners. In a small pan heat butter and chocolate on a low heat, stir frequently. Cool of the mixture. In a large bowl beat eggs with sugar until smooth; add cool mixture of butter and chocolate. Add flour and baking powder. Mix all ingredients together very well. Bake on 350 F for 20 minutes. Beat cold heavy cream with a mixer. When the cream will start to thicken add sugar gradually. Beat until all ingredients will be thick. Mash blueberries with fork and add to the thick heavy cream. and close with top layer.